‘The most irresistible chocolate biscuit’! Each packet contains 11 Original Tim Tams, each biscuit consists of two layers of chocolate malted biscuit sandwiching a light creamy chocolate filling, all coated by a thin layer of textured milk chocolate. Three types of chocolate in one biscuit is more than any chocolate lover could wish for. According to Arnott’s themselves, what makes the Tim Tam so special, and sets it apart from all the other chocolate biscuits out there, is the filling – this unique creamy richness is delicately made up from hints of butter, vanilla and, naturally, delicious chocolate, to give the whole delicious little biscuit a slightly caramel taste. Arnott’s claim that 1 out of 2 households have a packet of Tim Tams, selling around 35 million packets a year! No wonder that Arnott’s Tim Tam’s have become somewhat of an Australian icon and piece of Australian history. Buy yourself a packet today and try the Tim Tam Slam! Biting off opposite corners and then using the Tim Tam as a straw, sucking a hot beverage through its biscuity centre. Delicious! For best results refrigerate first. The product is slightly heat affected, but perfectly safe to consume and should taste just as wonderful as usual! 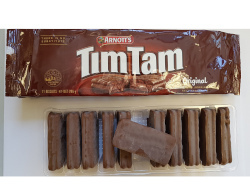 We are selling these Tim Tams that have a discoloured outing that appears slightly whiter than normal. Possible reasons for this include that it has been somewhere too hot, although we try very hard to avoid this by shipping in a refrigerated container, or the chocolate may not have been tempered correctly. But we believe they still taste great, so we are selling them at a discounted price.